The Environment Agency is warning of an increased risk of fire car breakers’ yards, and urging operators to have Fire Prevention Plans in place. 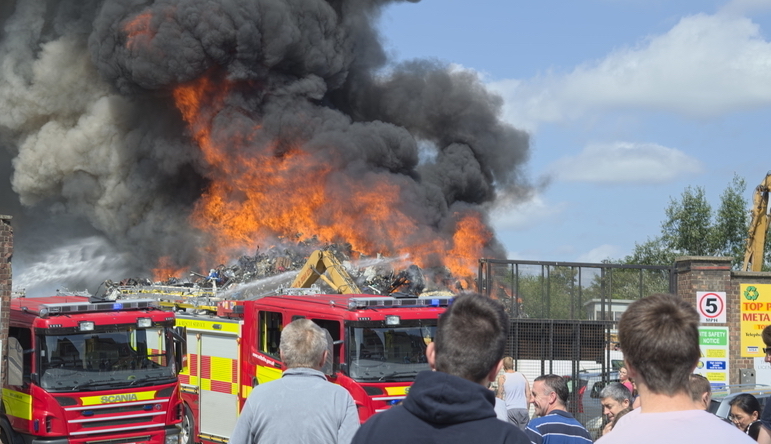 The warning follows a number of severe waste fires recently including an incident which forced Coventry Airport to close temporarily and another fire in Witney resulted in the public being warned of the potential for asbestos debris being deposited. Reports of fires at car breakers have increased steadily in recent years. In 2017 the EA received reports of 24 fires at end of life vehicle sites and 21 reports in 2016. The regulator is urging the operators to ensure they have FPP in place to minimise the risk to the environment, local communities and workers on site. Malcolm Lythgo, Head of Waste Regulation at the Environment Agency said: “Fires on waste sites, particularly sites handling hazardous components, unfortunately happen all year round. However, dry, warm weather conditions bring an increased risk. “It’s really important that those handling end of life vehicles have Fire Prevention Plans in place and engage with the Environment Agency for advice and support on keeping their sites safe. This is not just good for businesses, but also helps to safeguard the environment and surrounding communities. Disconnecting and removing batteries as soon as reasonably practical after vehicles arrive on site, to reduce the risk of electrical short circuits. Using safe depollution equipment and storing fuel in containers designed to store it. Ensuring vehicles are fully depolluted before crushing and shredding. Following the Environment Agency guidance and putting a Fire Prevention Plan in place.